This is an odd issue - the shadowed faces and hard hats on the Yancy Street Gang (yes, that is who those are) always seemed a little out of place, though I otherwise like the two-issue storyline. 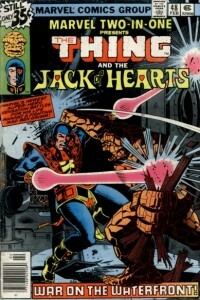 I like Jack of Hearts, but in black and white here his costume is a little... awkward. The arrow under his crotch pointing upwards is actually a little laughable. And I just don't like Ben's look here - perhaps its the difference in inking, but I find it hard to believe that my art from MTIO 59 is by the same artist! And what's with Ben's carrot nose in panel 3? Still, on the plus side panel 5 is excellently drawn, and I do like the look of the back of Jack's costume in panel 4. 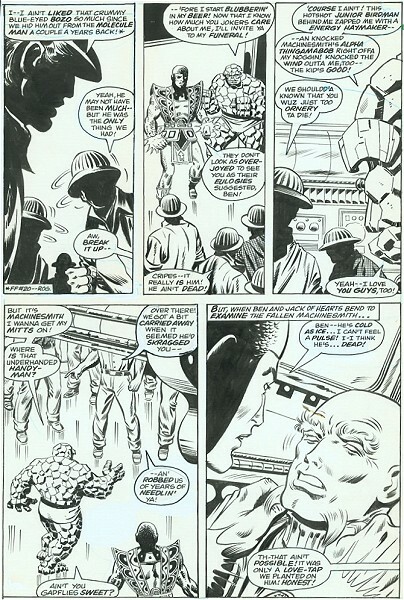 This was picked up on EBay in June of 2007; the seller "forgot" to mention minor details like the fact that the upper left panel is taped to the rest of the page, or that two of the text blurbs seem to be pasted on and are on some sort of paper which isn't the standard Marvel, or that there's a major bend down the page center (a bend which did not come from the shipping, as the bend has discolored the tape over the years). Such is EBay - I think its the first time where I've felt a seller intentionally failed to disclose facts to me (well, excepting the guy who put me off for 60 days before finally emailing back to confess that the item I had purchased had long since been destroyed), but this one isn't worth causing a fuss over. Still, all in all, as you may be able to tell this is not one of my favorite purchases.